BleachHouseLibrary.ie: Kitty Hawk and the Curse of the Yukon Gold (Kitty Hawk Flying Detective Agency Series Book 1) by Iain Reading. Review by Mia, aged 11. 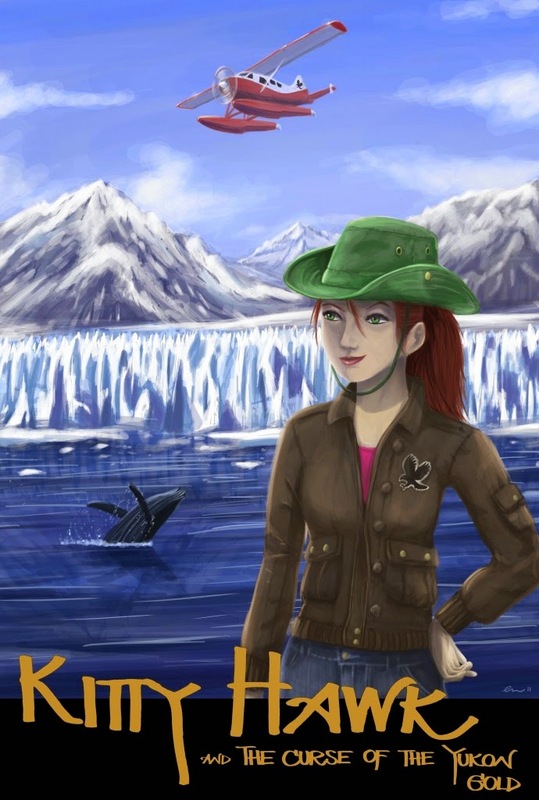 Kitty Hawk and the Curse of the Yukon Gold (Kitty Hawk Flying Detective Agency Series Book 1) by Iain Reading. Review by Mia, aged 11. This book is about a teenager called Kitty Hawk who has raised money to fly from her home in Tofino, Canada to Juneau, Alaska in her De Havilland Bearer seaplane. She is going to do some humpback whale research. During this research trip she discovers a fishing boat that crosses her route often and decides to follow it. She then finds out, near the Dyea Ruins in Skagway, Alaska, that the fishing boat passengers are gold thieves. This discovery brings Kitty to climb the Chilkoot Pass to the small city of Dawson and many more historical sites. This book was amazing and it just goes to show that you don't have to rely on really famous authors like JK Rowling, David Walliams, James Patterson, etc to write a great book. It is a good idea to try out new authors, like Iain Reading, Erika McGann and Sarah Holding, as well as big-name ones and you might discover a new favourite! Kitty Hawk and the Curse of the Yukon Gold is available in paperback and ebook format and is first in the Kitty Hawk Series. The Kitty Hawk Flying Detective Agency is a thrilling new series of adventure mystery books that are one part travel, one part history and five parts adventure. The books feature Kitty Hawk, an intrepid teenage pilot with her own De Havilland Beaver seaplane and a nose for mystery and intrigue. A cross between Amelia Earhart, Nancy Drew, Harriet the Spy and Pippi Longstocking, Kitty is a quirky young heroine with boundless curiosity and a knack for getting herself into all kinds of precarious situations. The Kitty Hawk Flying Detective Agency books are perfect to fire the imaginations of readers of all ages. Filled with fascinating and highly Google-able locations and history they will have armchair explorers and amateur detectives alike anxiously following every twist and turn and will inspire anyone to learn and experience more of this amazing planet for themselves as Kitty sets out on the ultimate adventure - flying around the world!